Figure 1. Stripe rust in a “striped pattern” on winter wheat leaves. The 2016 Wisconsin winter wheat field season was reasonably successful with very high yields and low levels of Fusarium head blight throughout much of the state. The major disease concern this season was stripe rust. Some cultivars were hit very hard by this disease. Since 2000, stripe rust has become an increasing concern on winter wheat in the Midwest. In Wisconsin over the last four seasons, we have observed consistent stripe rust pressure on some varieties throughout the wheat production area of the state. Because of the consistent occurrence of stripe rust over the last few seasons, it is reasonable to expect continued pressure from this disease in 2017. Stripe rust is caused by the fungus Puccninia striiformis. This fungus is in the same group of organisms that cause other rust diseases of wheat such as leaf rust and also the famed disease stem rust, which put the importance of wheat breeding on the map. 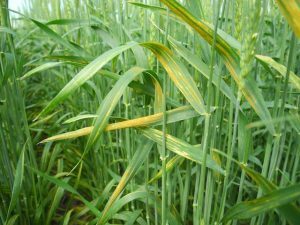 Stripe rust can be identified readily by the bright yellow pustules that typically occur in a striped pattern on the surface of the wheat leaf (Fig. 1). The stripe rust pathogen survives on wheat debris as spores or mycelium (fungal threads) in areas where the temperatures don’t get above 90 F or below 20 F. It is thought that stripe rust cannot overwinter in the far northern areas of the U.S. such as Wisconsin. Little is know if the stripe rust fungus can survive the summers in Wisconsin, once the wheat crop has been harvested. We are working on trying to understand the epidemiology of this pathogen better. Because survival of the fungus might be limited in Wisconsin, the stripe rust pathogen most likely has to be windblown from the southern states into our wheat production area. This is why we need to pay close attention to stripe rust reports from the southern states. Management of stripe rust includes using resistant cultivars and applying fungicide, along with using some cultural practices such as avoiding excessive fertilizer applications and eliminating volunteer wheat plants. Your job in managing stripe rust really begins now before planting. Take time to study the 2016 Wisconsin Winter Wheat Performance Trial report. These 2016 trial results include ratings for stripe rust. Locate the trial that was situated closest to you and look for a wheat variety that yielded well and had little stripe rust. In 2016, stripe rust caused a significant amount of yield reduction in the state. Across all varieties and variety testing locations in the state, the average yield potential was 130 bu/a. This was an excellent yield potential, however stripe rust caused a significant reduction in yield on susceptible varieties. 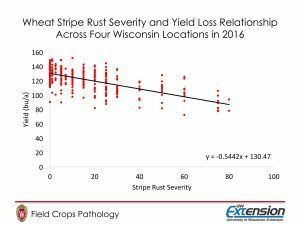 In 2016 approximately 5.4 bu/a were lost for every 10% increase in flag leaf stripe rust severity (area of the flag leaf covered in rust) in Wisconsin (Fig. 2). This is a substantial yield reduction in these trials. It should be noted that no fungicide was used, thus, some wheat varieties have excellent resistance and yield potential and should be top choices to consider for planting in 2017. 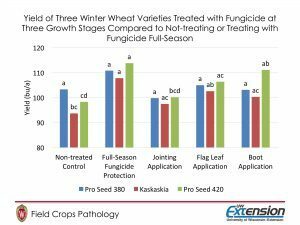 In addition to choosing a resistant winter wheat variety, you can start making some decisions on what your fungicide program might look like. There are several effective fungicides for stripe rust. To find a product with an excellent efficacy rating, consult the Small Grains Fungicide Efficacy Table. Once you have sourced a suitable fungicide for your operation, timing of application of that product becomes the most important decision. We conducted an integrated management trial for stripe rust of winter wheat in 2016. In that trial we applied fungicides at three growth stage timings (jointing, flag leaf emergence, boot stage) and compared them to a non-treated control or full-season fungicide protection (not a recommended program, but was used as a positive control or best-case scenario). We applied fungicide at these growth stages on wheat varieties rated as resistant (Pro Seed 380), moderately susceptible (Kaskaskia), and susceptible (Pro Seed 420). Figure 3 shows the mean relative stripe rust incidence (number of plants per plot with stripe rust) at each fungicide application timing on the three varieties. You will note that Pro Seed 380 was resistant enough that very little stripe rust occurred even in the non-treated control. Fungicide application on this variety resulted in no difference because of the low incidence. 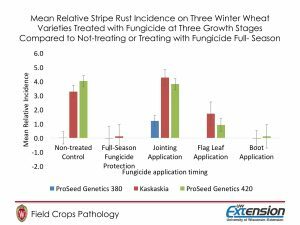 For Kaskaskia and Pro seed 420, however, the flag leaf and boot fungicide application timings offered suitable reductions in stripe rust incidence. The reason for this response is that stripe rust was first observed around the emerging flag leaf growth stage. Thus, fungicide application timing near the appearance of the disease offered excellent control. Figure 4 shows the mean yield response for for these same treatments. The trend followed that of the incidence data. No significant yield response was observed for Pro Seed 380 for any of the fungicide application timings, as it was highly resistant to stripe rust. Kaskaskia and Pro Seed 420 responded to the fungicide application timing with the best single application being either the flag leaf or boot application timing. To best manage stripe rust on winter wheat in 2017, start now by choosing the most resistant, highest-yielding variety appropriate for your location based on the 2016 Wisconsin Winter Wheat Performance Trial report. Once you have chosen your variety, choose a fungicide that will best fit your operation, with a high level of efficacy based on the Small Grains Fungicide Efficacy Table. Next spring begin scouting your wheat crop frequently. Don’t use your fungicide application until you first see stripe rust. This will likely be closer to flag leaf emergence or the boot stage in Wisconsin. Don’t forget about other diseases like Fusarium head blight (FHB). You might have to treat twice with fungicide if the weather is conducive next season for FHB and you have to spray early for stripe rust. Remember that fungicides effectively protect wheat plants for around 14 days. To learn more about managing FHB in 2017, CLICK HERE.